I have previously documented (albeit briefly) my casualty markers, here, which were not unit specific - just a dead person in one of three poses. I'd painted them in none uniform, civilian colours thinking that they could be used randomly. My recent cavalry expansion, and the realisation that my artillery had no casualty markers meant some more were required. 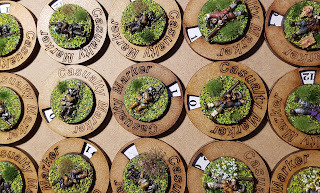 I painted up the harquebusier casualties really quickly then had my light bulb moment: "I wonder if I have enough cavalry casualty figures for every cavalry regiment? ", which then quickly metamorphosised into "casualty markers shouldn't be random they should be unit specific". Once I had got my head around what to do, and how many of each casualty type was required, I quickly realised that I had exactly what I needed, I didn't need to buy anything else. Spares box to the rescue. Now cavalry units have a dead harquebusier marker. Foot regiments have a dead musketeer - some repainting was required to match casualty coat colours to unit coat colours. Dragoons, artillery and siege teams have the generic casualty figure - again, some minor repainting was required. And the Covenanters have a dead new romantic pop star - all long flowing hair and Mr Darcy cheese cloth shirt, for their regiments of foot; same guy but with cap for artillery units; and a harquebusier with Scot's cap for their lancer regiment. Whilst reorganising my casualty markers I realised that I have changed my flesh painting technique (I now use Coat d'Arms flesh with Citadel Reiken Flesh wash), and that the first batch of casualty figures looked a little incongruous compared to the most recently painted figures. Needless to say they have now had their flesh repainted. 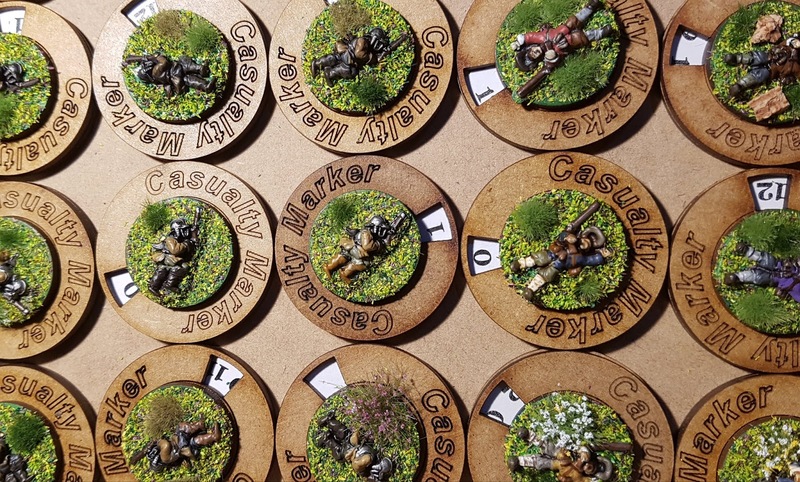 Doesn't sound a massive task, but when you have 70+ casualty markers it was quite a feat of organisation. 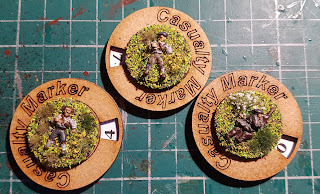 It does make me think why I didn't organise my casualty markers like this in the first place. Those markers look great. I have done something very similar for my 28s. I haven't assigned particular markers to particular units, but I have tried to have something that matches up. e.g. red coated casualties for red coated regiments. Cavalryman for horse regiments. etc. Thanks, yes I sense they could come back to haunt me - setting up time.